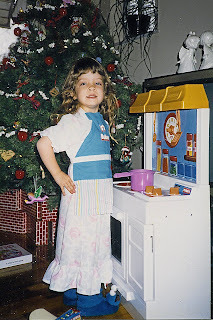 Actually, I had another one that my Pap made me - Mom & I had matching, homemade aprons from Pap! (Read more about Pap here.) I grew out of those and haven't used an apron since I've been cooking as an adult. For my birthday my dear friend Christine got me an adorable apron and I was really excited about it! A week later Bryce's Mom's birthday gifts for me arrived and, yet, another apron! The two were totally different and both so cute. Just a few weeks after that, John & Brooke sent us thank you gifts for helping with the cookie table at their wedding (which I still need to blog about!) and my gift was another apron! So now I have three adorable aprons. My problem is I always forget to put on one and they're so cute I'm afraid to get them dirty! They're just too cute not to show off. Thanks ladies for the aprons! I have a couple of different aprons (one from my mom, one I found at a vintage store and another that my great grandmother made). I just rotate them...when one gets dirty, I've got a clean one waiting. Don't worry about getting them dirty! That's what they're for!!! Thanks, Brookie, for the apron and the tips! I remember your apron in Palolo. On your next visit home, there will be an apron awaiting your visit, that I made just for you!!! It's sooo cute, navy blue, with little Golden Retrievers on it...I'm sure you remember that fabric!!! Mom - that's hilarious! I'll keep it at your house for all the cooking/baking we do when I'm home. Maybe I can wear it the next time we eat dog biscotti, too.